One of my favorite restaurants, Wisteria, is a kind of Venn diagram solution – a safe purple roundtable joining the red circle of food conservatives and the blue ring of food progressives. 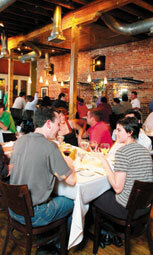 Perhaps because it’s an unashamed crowd-pleaser, focused on building consensus rather than making a statement, Wisteria has long been an underrated, low-profile establishment. Make no mistake, however: Wisteria’s fare is as seriously good as its atmosphere is invitingly intimate. It’s perfect for a quiet, romantic Valentine dinner, whether yours is a “mixed marriage” of adventurous and timid tastes, or perfectly attuned. Traditionalists’ eyes will leap to such Southern menu offerings as molasses-rubbed pork tenderloin with sweet potato soufflé, fried catfish, iron-skillet chicken with bacon-braised collards and corn pudding, iceberg-wedge salad with Point Reyes blue cheese dressing and applewood-smoked bacon crumbles. Chef/Proprietor Jason Hill delivers on these delicious-sounding dishes, with presentations visually equaling the gustatory delights. There are no precious stacks or towers here, no strange stems sticking out like proclamations – just perfectly cooked herb-crusted rack of lamb, with crisp roasted asparagus. Just creamy grits with that buttery, pale-centered skatefish. Simply paper-thin raw delectable beef with horseradish dribbles, and finely shaved, aromatic Parmesan. And that chicken? You could serve it to Casper Milquetoast or Joan Jett – and they’ll both ask for a take-home box. Although the food is the main reason to go to Wisteria, it’s not the only one – open nightly, accepting reservations and serving dinner relatively late, it makes a handy after-theater destination if you can get there quickly. When I’m not in a rush, I like to go in time to have a cocktail, because the bar attracts a loose gathering of interesting and chatty folks, and serves up one of the best Manhattans in town. I also love the wine list, with a big selection of interesting stuff by the glass, half-bottle and bottle (including one of my favorites, Sokol Blosser Evolution No. 9, at a reasonable $33). Finally, the service is great – jill-and-johnny-on-the-spot without being intrusive; friendly but not obsequious.